Shah Rukh Khan is all set to kick start the promotions of his upcoming film Chennai Express, which is now due in a couple of months — 9 August 2013 to be precise. Buzz is that the actor, who's also the co-owner of Indian Premier League (IPL) franchise Kolkata Knight Riders (KKR), will appear on Extra Innings T20 during the cricket extravaganza's final face-off to promote the upcoming film. The actor has already come up with a promotional trailer for his appearance on the show as well and has urged his fans to "express yourself". The title track of the Rohit Shetty film plays in the background of the promo. "Watch the IPL finals with me and express yourself," says SRK in the promo for the show, which airs on Set MAX. He might even launch the official trailer of the movie during the IPL final Sunday. Chennai Express also stars Deepika Padukone, who's back on screen with SRK, after her debut with him in 2007 in the blockbuster Om Shanti Om. View the SRK IPL promo below and let us know what you think of it. 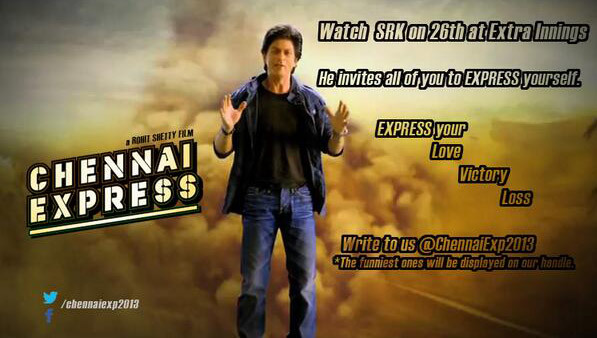 Are you looking forward to Chennai Express?